Sometimes you want a cake to celebrate a special occasion and sometimes you need a dessert at the end of a celebratory meal – so why not make something that covers all bases? This Amaretti and Apricot cake fulfilled both tasks at a recent family celebration, and the leftovers made an excellent accompaniment to brunch the following morning! This cake is moist and sweet, and with the addition of some stewed fruit, maybe some cream or even a dollop of vanilla ice cream, is transformed into something heavenly to end a meal with. It also feeds about ten people, so is perfect for a large gathering. Best of all, it is a really easy cake to make! INGREDIENTS: 200g butter or Stork (I used the latter as this cake needed to be dairy-free), 200g caster sugar, 200g self raising flour, 1 tsp baking powder, 4 large eggs, 1tsp almond essence, 410g can of apricot halves, 120g amaretti biscuits (for anyone else wanting to make this dairy free, check the ingredients of the amaretti biscuits – some include milk powder but good ones shouldn’t). All the things you need for this pudding/cake – its quite simple really! Heat the oven to 160 (fan) and butter and line a 23cm loose-bottomed cake tin. Cream the butter and sugar and then mix in the flour and baking powder. It will be quite thick at this stage. Add in the eggs one at a time. I suggest breaking them into a smaller bowl first, just to make sure you don’t get a dud one! Add the almond essence and mix it all quite hard – it should be smooth and creamy and a bit fluffy. Take a quarter of the mixture and set it aside. Drain the apricots and chop them up roughly, then add them to the larger portion of cake batter. Bash the amaretti biscuits into chunky pieces. Add 1/4 of the pieces to the apricot batter. Put the apricot batter into the tin and smooth over. Pop it in the oven for 25 minutes. While the cake is in the oven, add half of the remaining crushed amaretti biscuits to the remaining portion of batter. 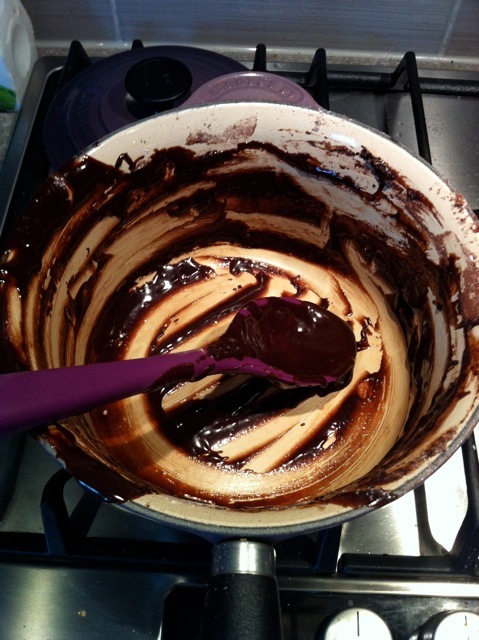 When the cake has had 25 minutes in the oven, take it out and quickly spread the remainder of the batter over the top. It is easiest to dollop on blobs of the mixture and then work them together. Do this quickly though so that the cake doesn’t sink. Sprinkle the remaining amaretti crumbs on top of the cake and pop back in the oven for another 20 minutes, or until a skewer comes out clean. Your finished cake should be two-tone, with a lighter crust from the late addition of the second batch of batter. The top layer had an almond-y crunch and the bottom layer is full of moist fruit. This was such a winner I think it is going to become a dinner party staple! For more of a pudding feel, save half the apricots and pop the whole halves on the top with the second batch of batter so that they form little igloos on the top of the cake. Sprinkle the top with a mixture of icing sugar and gold glitter for a real wow-factor effect. I hope you enjoy this little gem of a recipe! Its nearly Christmas folks, so I’ll try and get in a recipe for the holiday season before the end of the year – if anyone has any requests let me know! Things Don’t Always Go to Plan…. 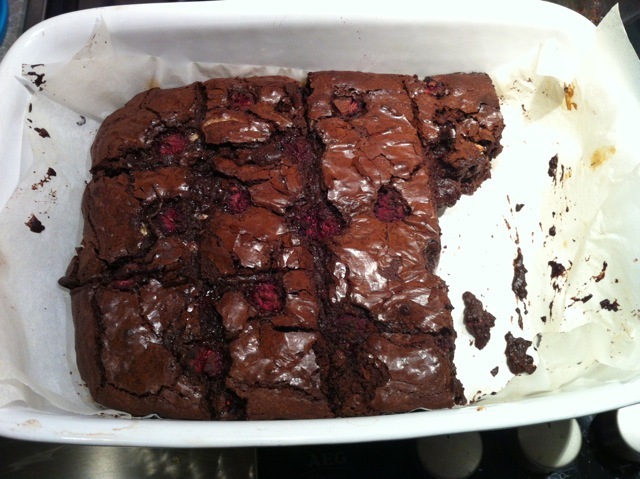 Chocolate and Raspberry Brownies. I discovered this weekend that when it comes to baking, no doesn’t always mean no (although at 2am when I’m trying to sleep and Mr. Bandit comes in reeking of booze and kebabs it certainly does). Having told me not to bake anything for a while because he was enjoying the cake a bit too much, this weekend, in his hour of cakey need, I was told that just because he said don’t make anything doesn’t mean I should have listened. 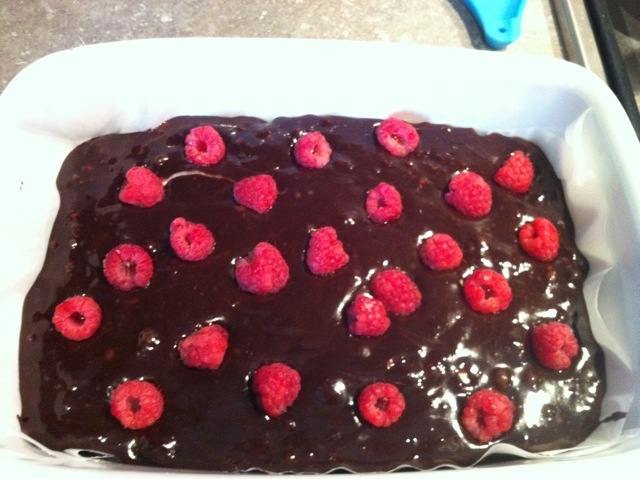 So I sent him off to the shops and moments later was busily making chocolate and raspberry brownies. I love soft fruits and at this time of year and generally find brownies a bit cloying so a hit of lovely tangy fruit was just what the doctor ordered. Mr. Bandit likes white chocolate with raspberries so I adapted the recipe a bit for him. 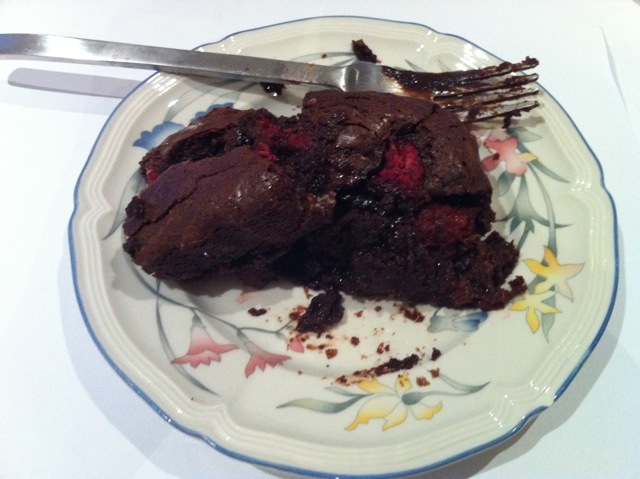 Now I was debating whether or not to blog about these brownies, because, frankly, things didn’t go to plan. But baking doesn’t always go to plan and even when things aren’t quite right, they are often salvageable. That’s what happened with these, so here’s what happened…. Whatever the final outcome, there’s still always a fight over who gets to lick the spoon! For the brownies you need 200g dark chocolate, 100g milk or white chocolate, 250g butter, 350g soft light brown sugar, 4 large eggs, 140g plain flour, 50g cocoa powder, 200g raspberries. Heat the oven to 180 degrees and line a tin about 20 by 30 cm with baking paper. Or, for ease, use two smaller tins. Put the sugar, dark chocolate, half the white chocolate and butter in a pan and heat gently until the sugar has disolved and everything else melted. Remove the pan from the heat and when its cooled a little, add each of the eggs one by one and whisk them into the mixture. Don’t do this when the mixture is too hot or you’ll get scrambled eggs. Sift in the flour and cocoa and stir with vigour! Stir in half the raspberries and then pour the mix into the tin/s. Scatter the rest of the raspberries over the top and do the same with the remaining white chocolate (but chop it into chunks first!). Looking delicious even before they’re cooked! Pop in the oven for 40 minutes and then check. There should be a spring in the brownies, you don’t want them too cakey, but they shouldn’t be runny either. If they’re still too runny, put them in for another 10-15 minutes but keep an eye on them. So, back into the oven it went, and 15 minutes later – because I’d let it cool in between – it still wasn’t completely cooked. However, by this point we’d been smelling the amazing chocolatey goodness for too long and we were too impatient. So out it came and we decided to dig into the hot, squidgy sort of finished brownies for a dessert. Hot and squidgy – yum! So, although this didn’t quite work initially as brownies, they made the most amazing dessert. The image doesn’t quite show but the middle of the piece is still a wee bit too gooey. However, the eggs are cooked so its totally ok to eat. This was like a giant chocolate fondant and would make an amazing pud with some ice cream or creme fraiche. I then put the rest of the brownie tin back into the (now switched off) oven for 20 minutes and then they were cooked perfectly. Despite not turning out quite right initially, we still managed to eat a good sized chunk! So, these brownies didn’t quite work initially, but I’m pretty sure that 40 minutes in the oven followed by a check and then possibly another 10-15 minutes would work perfectly, or just 40 minutes if you fancy them as a dessert. Remember that even when cooked, they don’t properly harden until cool. I will have another go at these in the future and will update this post on cooking times once I’m 100% sure what works best. If you placed the mix in two smaller tins, 30-40 mins would be fine. These will keep in the fridge for a few days. And the most important thing? It worked in the end and I discovered a very nice dessert in the process! And I also learned that in baking, no doesn’t always mean no. Having said that, Mr. Bandit is off to France next weekend, so I might have a weekend off baking then.